This entry was posted in Information Literacy, Leadership, School Librarianship and tagged coteaching, instructional leadership by Judi Moreillon. Bookmark the permalink. I enjoyed reading this post. I’m writing to express my frustration at a particular situation I find myself in: I have recently moved from an open, democratic internet culture to a closed, internet controlled society. My students are not native English speakers, and their online lives take place in a language which I don’t understand and is not written in the Roman alphabet. 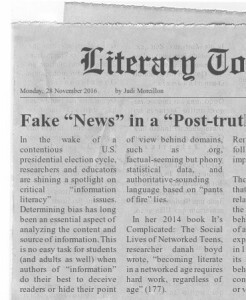 These teens possess a singular combination of indifference and jadedness regarding truth, news, and information literacy. I don’t even know where to start with them sometimes! When we discuss politics or the recent US election, it seems funny and somehow normal to them. Anyway, thank you for “listening” to my comment. I hope that over time some of what we are doing will sink in. Susan, Thank you for sharing the complexity of the literacy learning and teaching situation in which you work. Your comment about your students thinking that the recent US election cycle was “funny” and somehow “normal” to them struck a cord with me. I, for one, hope that U.S. politicians’ and voters’ recent electoral experience is not a “new normal.” Wishing you the best in your work. 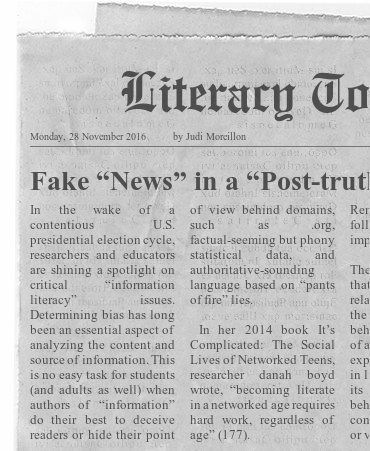 I thought it was very interesting–and quite telling!–that the Stanford study was released right around the time “post-truth” was chosen as the word of the year. Definitely two facets of the same issue.